Tired of spending countless hours churning out proposals with little to show for them? Unfortunately, that’s the reality most web developers live in. They’re invisible to the best clients. And they end up not getting paid the rates they deserve because they struggle to convey the true value of their services in their proposals. Many developers are unknowingly making the same mistakes over and over again in their proposals—mistakes that blow their chances with quality clients. But you can avoid where they go wrong by using a bit of strategy and a special framework to get the right people’s attention. If you’re tired of wasting time and want to know how to write a web development proposal that sells, keep reading. But clients expect to see them before they’ll hire you. So you know you need to keep writing (and submitting) them to have a chance at working with the people you really want to work with. This leaves a lot of talented web developers in a bind. They churn out proposals year after year—constantly making the same mistakes—without ever getting the best clients’ attention. Many have plenty of technical expertise, but they can’t convey that expertise in a compelling way. What should you talk about in your web development proposals? How do you tie everything together? For most web developers, there are plenty of unanswered questions. Getting to the bottom of them could save time, help land more clients, and make the proposal process a lot less frustrating. Why is submitting solid proposals so important? Because they allow savvy web developers like yourself to: 1) make a memorable impression, and 2) persuade top clients to hire you. The best clients—the ones everyone wants to work with—are going through hundreds of proposals for every project they offer. There isn’t enough time in the day to read them all, so anything that doesn’t grab their attention right away and hang onto it gets ignored. Generic, bland proposals (what 99% of web developers submit) get ignored (bad) or leave a bad taste in the client’s mouth (worse). They overwhelm clients with technical details. And they don’t give clients a way to distinguish that developer from all the rest. Without a compelling proposal, clients are left with only one way to compare service providers: price. You have to end up slashing your rates, and that’s a game you don’t want to play. Proposals are a necessary part of doing business, but they don’t have to be burdens. With a little strategy and a framework to follow, you can utilize your proposals as sales tools to grab clients’ attention and convince them to hire you. Every web development project is different, so you’ll need to customize some of your proposal content to reflect that. But every proposal you submit could benefit from a logical, persuasive structure. Including the elements below in the order they’re listed will help you get clients’ attention and convey the value of your services in a compelling way. Think of it as a bare bones framework you can easily customize to suit any web development project. Following this structure will save you time and frustration. Instead of staring at a blank page and spinning your wheels, you’ll say what you need to say to land more clients. Clients aren’t in the market for technical expertise. You have plenty of that, but that isn’t what they’re buying. Clients are only interested in solutions to their problems. The services you recommend as a developer are designed to solve those problems, but it’s easy for that to get “lost in translation” when you’re trying to convey it in proposals. That’s why it’s so important to get clear about the source of the client’s frustrations—what led them to offer the web development project in the first place. A lot of developers get into trouble because their proposals just reiterate the client’s project specifications. They don’t dig beneath the surface level of the project, which doesn’t help them in their quest to make clients feel understood. XYZ Company is looking to expand the functionality of its website by adding an e-commerce platform. This platform should allow users to browse XYZ Company’s inventory from a variety of angles and distances, compare features of different jewelry pieces, as well as create custom-order pieces available to purchase and ship worldwide. This problem statement isn’t telling the client anything they don’t already know. It blends right in with all the other generic proposals they receive. As more of XYZ Company’s target customers take their shopping online, annual revenue at XYZ Company’s brick and mortar stores has decreased this year by 20%. XYZ Company needs to focus its efforts on e-commerce in order to align with changing consumer tastes and successfully compete with lower-priced big box competitors like Jared and Zale’s. They can do this by offering their inventory online via an engaging, user-friendly e-commerce platform. Once in place, this e-commerce platform will allow XYZ Company to reach new customers from all over the world and replicate their unparalleled in-store customer experience that made them a market leader in the first place. See how that works? This problem statement drills down beneath the project specifications and gets to the heart of the issue: slipping revenue. That’s what’s keeping the client up at night; that’s what they need you to solve. Most clients aren’t as tech savvy as you are. Plenty won’t even know what their deeper problems are… much less be able to articulate them. All they know is something isn’t working on their website how they want it to, and they need help. You might have to do some digging beforehand. If you research your client’s business, competition, and their niche—and share those insights in your problem statement—you get attention right away. You send a clear message you understand the client better than anyone else. Once you’ve identified the problem, it’s time to show clients how you’ll solve it. This seems obvious. But it’s amazing how many developers screw this part up. They think they’re handling this right by listing a set of recommended services. We recommend a mobile-responsive e-commerce platform, which will include a database to hold profiles of XYZ Company’s jewelry pieces, a script to generate the product pages, and an online shopping cart feature. These might be just the services the client needs to solve his or her problem. But the proposed solution does a poor job of conveying that. It puts the burden on the client to read through the lines and figure out how that laundry list of services would help them. That’s a recipe for disaster with busy, non-tech savvy clients. It’s making way too many assumptions. We recommend a mobile-responsive e-commerce platform to display and sell XYZ Company’s inventory. This will ensure XYZ Company’s jewelry pieces look compelling regardless how users experience them—whether via computers, tablets, or mobile devices. This e-commerce platform will include a database containing profiles of all of XYZ Company’s jewelry pieces. Users get to access XYZ Company’s full catalog from the moment the e-commerce platform goes live. And it’s simple for XYZ Company to add or delete profiles to reflect changes to their product lines. Our e-commerce platform will also include a user-friendly online shopping cart. This shopping cart, which will recommend related products and automatically complete form fields for repeat customers, will help XYZ Company maximize their average order value and ensure as many online shoppers complete transactions as possible. This example is more compelling because it takes chance out of the equation. It ties everything the developer plans to do to valuable client benefits. There’s nothing for the client to figure out because all the technical stuff has been broken down. Frame how your services will provide the solution the client needs, and you’ll have their undivided their attention. You’ll put yourself ahead of 99% of the other web development proposals in their inbox. It’s a question on every client’s mind. For a lot of developers—developers who do a poor job of conveying their value in their proposals—it’s the moment of truth that decides whether or not they’ll win a project. A solid problem statement and proposed solution sections will help you put your best foot forward and convey your unique value. Those things price less of an issue, but it’s still something you have to address. This can be scary. There’s a tendency to want to avoid this, save it for later, or try to justify every penny you plan to charge. But it doesn’t need to be something you shy away from. Simplicity is the key here. It’s amazing how many clients will be happy to pay you the rates you deserve… as long as your pricing information section is straightforward and easy to understand. 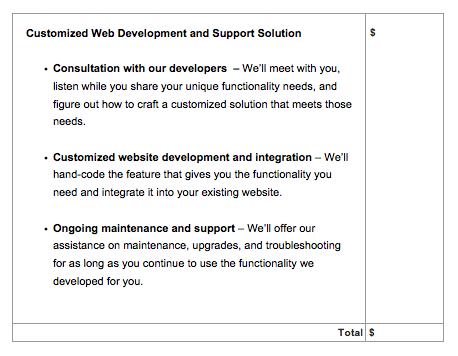 Because so many web development projects are long-term, you can use the pricing information section to connect payments to specific milestones. This helps set client expectations about how the process will work (a pricing section like this is usually called the Fee Schedule). Following the framework above won’t just help you save time; it puts you in the best position to submit compelling proposals. One reason why the framework is so effective: it relies on principles of persuasion. The same framework could help persuade clients whether you’re a developer, designer, or operating in a completely different niche. Using proposals to convey how you’ll solve clients’ problems is a great way to win business. But doing that and accounting for the future make them even more persuasive. Web development clients aren’t just interested in how you could solve their problems now. The most successful ones—the one you really want to work with—are also looking forward. They want to know how the functionality you develop for them will work six months or a year down the line. One of the strongest potential selling points is to discuss how your functionality won’t just integrate with the client’s current system; it will also “grow with the client” by accommodating their needs in the future. Touching on how you’ll position clients for long-term success is a great way to show them you understand them better than shortsighted developers only interested in quick cash. It shows clients you have a vested interest in their success. When you’re working with technology, crashes, bugs, and meltdowns are the name of the game. Even the least tech savvy clients understand that. They want the solution you can provide for them now, but they also want reassurance that everything will be okay when things (inevitably) go haywire. How long will the response take? What’s the timeframe? Will you provide support for a limited period of time? How long? Covering this stuff gives clients and developers peace of mind. Clients can plan their business, and developers can rest easy knowing they won’t get dozens of angry emails two years ago from a past client. Skirting these issues, however, is a recipe for disaster. You and your client might have dramatically different ideas about who’s on the hook if something goes wrong. It’s easy to end up doing extra work you had no intention of doing. Another potential sticky spot—and one many developers fail to address—is the transition between developing the functionality and implementing it. Addressing this in your proposal will help you get out in front of potential issues and even turn them into selling points. The key is to think this through from the client’s perspective. How will the “handoff” between developer and end-user work? It isn’t always as simple as letting the client know the functionality is ready to rock. But that means there are great opportunities to offer training, ongoing support, and other additional services to help clients navigate the transition from their “old” website to their “new” one. The clearer you can make this to your client, the better. They get clear expectations about what will happen when… and a strong sense that you’re keeping their best interest in mind. Just like with the issue of ongoing maintenance and support, failing to specify how this transition—from development to implementation—will take place is a recipe for disappointment, confusion, and extra work on your end. But yours don’t have to. Your web development proposals are the perfect place to make an unforgettable impression—one that gets attention and persuades the best clients to hire you. All it takes is a little strategy beforehand. Focus on the key elements above, and present them in a way that’s designed to persuade. You’ll save time, get the right people’s attention, and turn proposals into powerful sales tools that win more business. What do you struggle with the most about writing web development proposals? Leave a comment below and let me know!